The iconic nature of the images and their succinct, poignant mottos swept through Europe and was republished in many varying forms and languages. Looking through the collection, I can certainly still feel their influence, as we clearly still reference the same source material and style for similar purposes, such as monograms and logos. The golden fleece symbol most directly rung a bell in my mind, as it is currently used as the Brooks Brothers logo (and has been, apparently, since 1850). “Devises” (emblems) have been used in varying forms as identifiers for centuries. Whether used in print or as a crafted object such as a badge, these powerful iconic images take on a life of their own, conveying strongly held beliefs, status, and history. These emblems were used in aristocratic French society in the late fifteenth and sixteenth century and built off of the tradition military heraldry, which was in decline. These invented additional emblems were used not only as badges on coats, but also for any nature of decorative object. 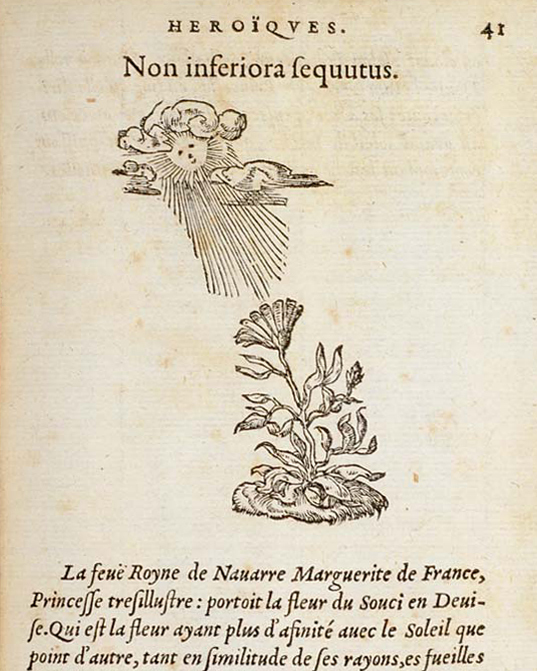 Claude Paradin’s printed collection of 118 of these images and their meanings, published in 1551, was the first to document this growing symbolic culture. Accompanied by the motto, “Intertwined Together It Returns to Itself". I am drawn to these illustrations for the same reasons they have attracted people for centuries. They are incredibly effective in their directness, calling upon a combination of natural, spiritual, and structural, man-made objects of beauty to ignite the imagination and inspire a sense of something bearing much more weight and meaning than their one-color, one line-weight execution belies. Their graphic quality, efficient yet detailed, allows the image to be instantly recognized and consumed. Their construction is focused on creating a striking composition that can be placed in any setting to instantly adorn it. Essentially, they are designed to be iconic, and we have been convinced. Translating to “Wet Dry,” the motto refers to the concept of fighting the cold with warmth. The motto translates roughly to the idea of never having been controlled by another man. This emblem represents the idea of natures constant recurrence in the face of obstacles. What would your emblem look like or your motto say? Definitely something to consider! All images are from University of Glasgow’s Emblem Website.